Now, a way of offsetting this would be to buy a drawing tablet with a screen. The problem with that is such devices are several thousand dollars at even the most basic level. So, while I tinkered with my drawing tablet and began working on my skills more, I found AutoDesk's SketchBook program. While it's not nearly as powerful as an application like Photoshop, it is more than capable of handling an actual drawing/painting artist's workload. It's intuitive, loaded with tools, and offers great integration with Photoshop for any additional touch-ups that may be required. So, when I saw there was an app version, of course I jumped on it. I love the app. I've used it to draw several comics recently. That being said, there are plenty of caveats to this. Think of them as requirements. Otherwise, the base app is only good for drawing stick figures. First and foremost, you need a stylus capable of precision. Now this could be the Apple pen or you could invest in a precision stylus. The one I use is from a company called Meko. For a set of two pens with extra pieces, I was set back $15 on Amazon. This was the hardest part, because I couldn't find any local stores that sold a precision stylus. 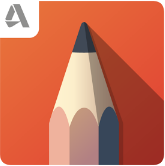 Secondly, you will need a pro subscription to SketchBook. This will unlock all the layers you'll ever need, additional pencils, etc., and the necessary tools. The subscription is cheap and carries across all of your devices. Since I already had the subscription on my computer, by the time I had a tablet, I was able to sign into my account on it and get all the tools I needed. Again, the base app isn't all that great. To really make anything of it, you will need the subscription. That being said, SketchBook provides the number one thing I had wanted from any art app, layers. Since being able to draw and work in layers, I've not gone back. Now, to make it even better, SketchBook also allows users to save their work in a number of folders, including Google Drive, OneDrive, export to Deviant Art, and more. So, it's easy to take the work from your tablet or phone to the computer and keep working when you're home. If you're an artist, this is a must have app.